Évora (pop 57,000) is a very historic city of central Portugal. It is not in the Algarve - I was visiting! It stands about 226km /140 miles north of Albufeira in the Algarve and about 136km / 85 miles east of Lisbon. If you are planning to spend time in Lisbon, trains to Évora start from LISBON ORIENTE station. They also stop at Lisbon Entrecampos and Lisbon Sete Rios before heading over the bridge and towards Évora. Check which station is most convenient. All are on the Lisbon metro and have many bus connections. Check timetables and buy tickets at www.cp.pt - seat reservations are required for all trains. There are currently only FOUR trains each weekday, leaving Lisbon Oriente at 0702, 0902, 1702 and 1902. At weekends and on public holidays there are only THREE trains, at 0952, 1702 and 1902. Journey time to Évora is about 1 hour 30 minutes. One way ticket (full price) €16,50 first class, €12,40 second class. Return trips leave Évora on weekdays at 0706, 0906, 1657 and 1906, on weekends and holidays at 0906, 1657 and 1906. You will need to make your way from the airport to the SETE RIOS bus terminal. This is about 3 miles/5km from the airport and is linked to it by the metro Red line. Take any train to the end of the line at São Sebastião, then change to the Blue line for a two stop ride to Jardim Zoológico station, which is adjacent to Sete Rios. Trains run every few minutes from 0630 daily. The journey will take around 25 minutes and cost €2. There is also a direct special bus, Aerobus 2, running about every 20 minutes. Consult the Aerobus website for details. For your bus options from elsewhere in the city check the city bus website at http://www.carris.pt/ Consult the long distance bus website www.rede-expressos.pt for Lisbon - Évora times, remember it's LISBOA on the timetable search. One-way fare is currently €11,90 and the journey takes about 1hr 45 minutes. There are about 12 journeys every day - click here for more detail. Rede Expressos also covers journeys to Évora from many towns and cities through Portugal. There are a few direct services from some Algarve towns eg Faro and Albufeira. Tickets can be bought on line up to 30 days in advance at the Rede Expressos website www.rede-expressos.pt. Reservation is strongly advised if planning to travel in either direction on Friday afternoons and Sunday evenings during the University and college terms, also around major holidays. Évora railway station is 10 - 15 minutes walk to the city centre and hotels. Taxis are available. There are local buses on weekdays, but there is no timetable information at the bus stop. The bus station (terminal) is a closer to the city centre, in Avenida Túlio Espanca almost opposite the Vila Galé hotel. Taxis are available, as well as a number of local bus connections for which see below. The tourist office is right in the city centre, at Praça do Giraldo, number 73. Évora is a walkable city, but some parts are a little hilly! If you need local buses around the city and immediate suburbs, consult the local bus company website at http://www.trevo.com.pt/pt/default.html which is only in Portuguese, or consult my additional information here. Évora is at the end of the railway line, so the train does not give any options apart from getting back to Lisbon. You can, with a change of train at Pinhal Novo, travel from and back to various towns in the Algarve, but the number of trains is obviously very limited. Évora bus station at about 10am on a weekday. Not much activity as you can see! Buses between Évora and neighbouring towns are operated by Rodoviária do Alentejo. Their buses are white with red panels. Many routes operate only two or three times a day on weekdays. Most bus routes do not operate at all at weekends or on public holidays. I have summarised those few routes that might be of use to visitors here. All routes start at the bus station. Some stop elsewhere in town depending on destination. The city bus website is www.trevo.com.pt - it is only in Portuguese. The two routes likely to be of most value to visitors are the two Linha Azul routes, numbers 51 and 52. These run every 15 minutes to and from the bus station through and around the old city. Service on these runs from 0800 to 2000 on weekdays, 0800 to 1400 on Saturdays. There is no service outside these hours. Details here. Other routes run out to more distant suburbs at irregular intervals, especially at weekends when only a skeleton service is provided, with some routes not operating at all. A single trip ticket is €1,30 except on Linha Azul (both) where the fare is €1 all day! If staying a while or using the buses more than five times, a ten trip pre pay ticket is €5,20 and a 20 trip ticket €10,40. These are available at the bus station, but not on board. Évora - buses useful to visitors for day trips out. There are no buses I know of to anywhere near the megaliths. Many routes around Évora operate only once a day, into the city in the morning and returning in the afternoon. I have not included these as they are of no value to a visitor based in the city. All regional buses are operated by Rodoviária do Alentejo - website www.rodalentejo.pt only in Portuguese. There is neither a map nor list of routes. You can search for point to point services between any two places but if there are none direct, nothing is shown. For timetables click the link. Buses DO NOT RUN at weekends and public holidays unless specifically stated. Some routes have extra buses or run at different times on SCHOOLDAYS (Periodo Escolar). 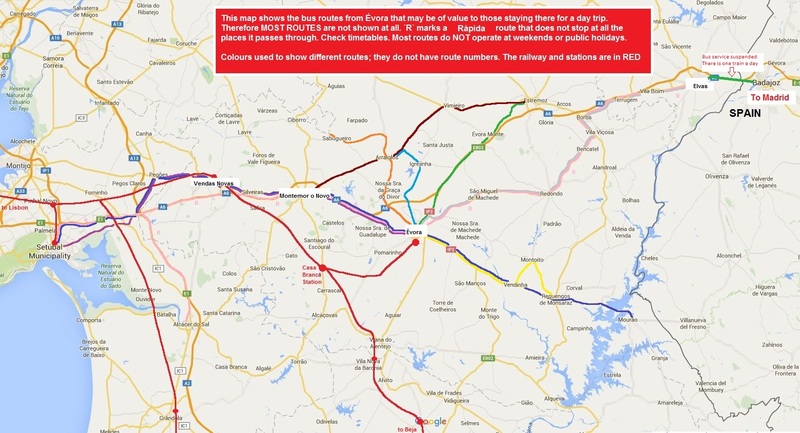 Check for times around local holidays as some routes do not operate on Carnaval day (Shrove Tuesday, which is an unofficial holiday but widely observed) also some do not run on the Monday after Easter Sunday. Route numbers are not shown on the buses, only the destination as below. Timetables are on display at the bus station. For a simple map showing these routes, click here. Azaruja for the cork factory (Azaruja is about 10 miles / 16km from Évora) take the bus going to Estremoz at 1025 returning at 1435 (except in August) and 1805. Journey is 27 minutes to Azaruja. 8007 to Estremoz via Arraiolos - one bus at 0740 changing at Arraiolos http://www.rodalentejo.pt/XlsHtml/h007.pdf see also 8076 and 8104 below. 8205 to Arraiolos - one bus from Évora at 0730 http://www.rodalentejo.pt/XlsHtml/H205.pdf see also 8007 and 8076 above. There a bus back into Évora at 1730hrs during school holidays, no bus otherwise. This route stops at Cerâmica. 8551 to Elvas on FRIDAYS only at 0900, returning from Elvas at 1600. 8558 to Badajoz- discontinued. See below for limited alternatives. 8902E to Montemor o Novo - Vendas Novas - Landeira - Setubal from Évora at 0630, 0900 and 1230 weekdays, 0900 and 1230 weekends and Holidays. Return from Setubal at 1300 daily, 1500 weekends and Holidays, 1615 weekdays and 1845 daily. http://www.rodalentejo.pt/XlsHtml/H902E.pdf - complete service is six buses each way on weekdays, four at weekends and on public holidays with additional weekday journeys between Setúbal and Vendas Novas, also Évora and Montemor-o-Novo. 8976 to Elvas via Redondo, Borba and Terrugem about 2 hours journey. One bus from Évora at 0815 during school holidays only returning at 1330. There is one other bus from Évora to Elvas, at 1700 weekdays only. Also from Elvas to Évora on weekdays at 1330 (school holidays) but 13435 on schooldays. Full times at http://www.rodalentejo.pt/XlsHtml/H976.pdf Rede-Expressos also operates four or five daily journeys to Elvas but there are no outbound journeys between 0015 and 1345. SERVICE TO BEJA suitable for a day out. Operated by Rede-Expressos http://www.rede-expressos.pt tickets must be obtained before boarding. Journey time is 1 hour 15 minutes. From Évora at 0900, 0930 and 1100 every day. Return from Beja at 1600 (Fridays only and not between 1 July and 15 September), 1700, 1800, 1900 (only in summer) and 1930 daily. Rede Expressos also has services to other towns, some not served by Rodoalentejo. Check their website for times and do so carefully as some require a change en route and some are very infrequent. Local train service was discontinued some years ago. The only trains at Évora are the four weekday (three at weekends) trains to and from Lisbon. These stop at Casa Branca, Vendas Novas, Pinhal Novo (for connections to Setubal and the Algarve) then on to the stations in Lisbon. Reservation is essential - see above. It is possible to travel by train between Évora and Beja by changing at Casa Branca, but the trip will take an hour longer than the buses above, which take a direct route. One train each day and two local buses on weekdays cross the border between Elvas, Portugal and the Spanish town of Badajoz. Problem is that Elvas is a long way from Évora, there are no trains and there are very few local buses. Connections I have found as below. The 1300 (Fridays) and the 1830 journeys from Elvas are operated by Rede-Expressos. Elvas railway station is almost 5km from the town! Towards Badajoz, the daily train leaves Elvas at 1253, arriving Badajoz at 1416 Spanish time. The return trip leaves Badjoz at 1624 Spanish time, arriving in Elvas at 1548 Portuguese time. Connections are available in both directions between Elvas and Lisbon via the junction at Entroncamento, also between Badajoz and Madrid. For the latter, go to www.renfe.com for times and tickets. Reservations are required in Spain. Taxis are available, the distance is about 20km. Rede - Expressos has these trips Évora to Elvas : 0015 arrive 0150 Mondays only, 1345 arrive 1500, 1700 arrive 1835 and 2105 arrive 2240 daily. If you have any comments or updates for this page, I will be pleased to receive them by email.